It’s all hands on deck in this fun family activity in which everyone gets their hands dirty – and no one cares. You will all be working together to make a framed family keepsake – perfect art work for your own wall or for giving to grandparents. 1. If you are recycling a picture frame, as we did, first clean the glass and the frame, then remove the cardboard or hardboard backing. Now take out the art work currently in the frame. Measure the opening and cut your piece of art paper to fit inside. 2. Set the art paper on a flat surface. 3. 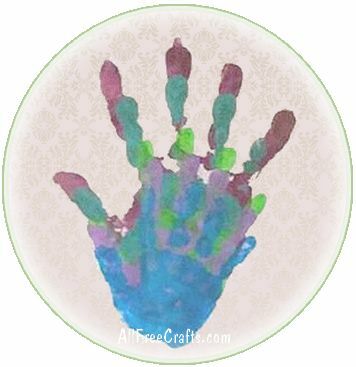 Start making hand prints, beginning with the largest member of your family and working on down to the youngest member of your family. Take the first person’s hand, and use the paint brush to apply a generous coat of paint to the palm and the underside of the fingers. Have this person make a hand print in the center of your paper, with fingers slightly spread apart. Make sure the hand is pressed down firmly to make a positive paint impression on the paper. Craft paint dries quickly, so allow the paint to dry before making the next hand print. 4. Repeat Step 3 for each person in your family, changing the color of paint for each person. Allow all the paint layers to dry completely. 5. If you like, add a small note about the painting on the back of the paper. Make a note of the year, and whose hand print was which color, and their age at the time. 6. 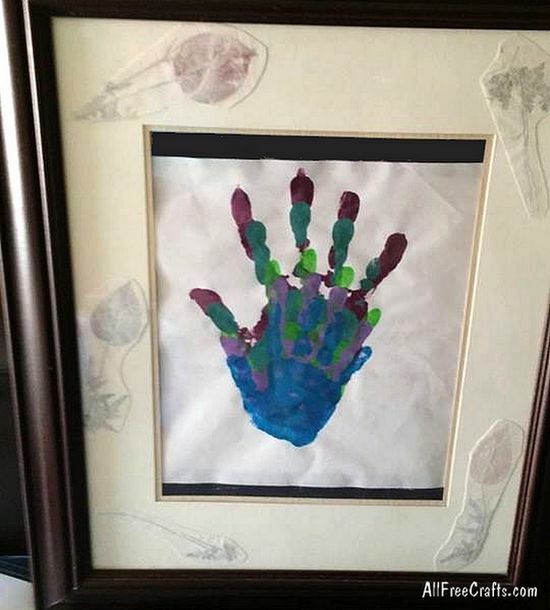 Place the completed family hand print into the frame and replace the backing. Done! Display on the wall, or give to grandparents, as a treasured reminder of your unique family in this space and time. » Buy an artwork-ready artist’s canvas of a suitable size. Paint the background in a light color and let dry, then proceed as explained above. » Do a version for Valentine’s Day, enclosing the hand prints in a heart-shaped frame. » Once your hand print creation is done, scan it before framing. Use the scanned picture as the front of homemade greeting cards or have greeting cards printed with your image.